Once, at the Cake Shop, we tried a little experiment with our cookies. We had a sidewalk sign that we could change out every day, so every few days, we would advertise a different cookie flavor, like “Warm Chocolate Chip Cookies – Now!” or “The Best Oatmeal Cookies in Town” or “Peanut Butter Cookie Day”. Guess which brought the most people in? The oatmeal cookies! We even got the local firefighters pulling up out front in their ladder truck (our landlords next door got a little excited until they realized nothing was on fire). Our popular oatmeal cookie recipe was adapted from a recipe called Giant Oatmeal Spice Cookies, published in Southern Living in 1980. It was a beloved recipe that we brought from home when we started the Bakery at Happy Chefs in the 90s then took with us when we opened the Cake Shop. 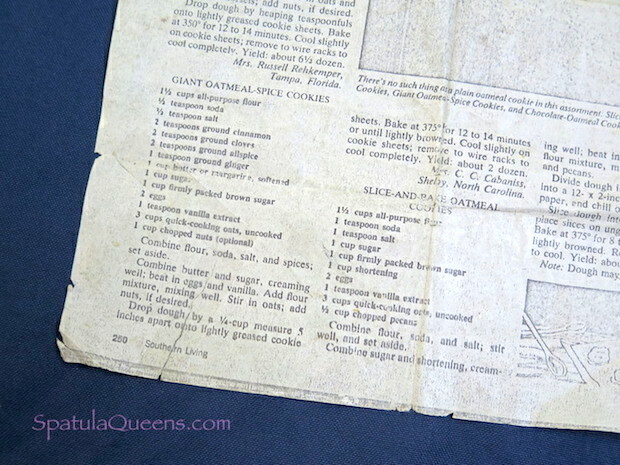 We still have a copy of the original recipe. We changed the original recipe by omitting most of the spices. We like the crunch of walnuts over pecans. We also added cut up dates – not the pre-cut, sugared variety – the whole, gooey, moist kind. 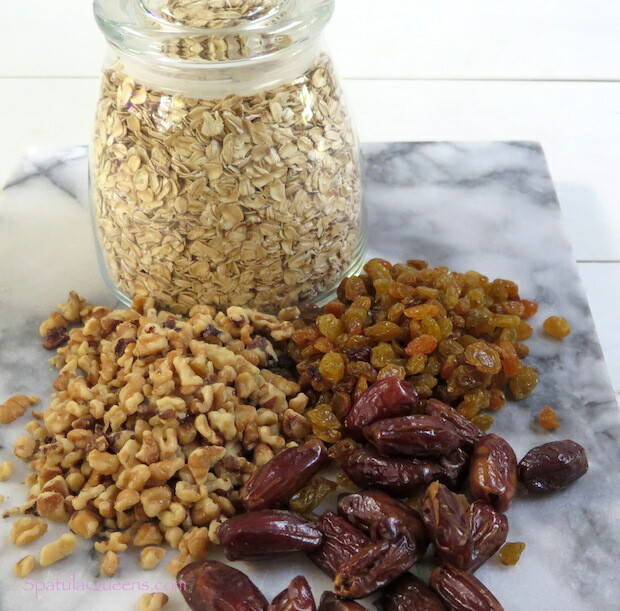 We also replaced the quick cooking oats with heartier old-fashioned oats. 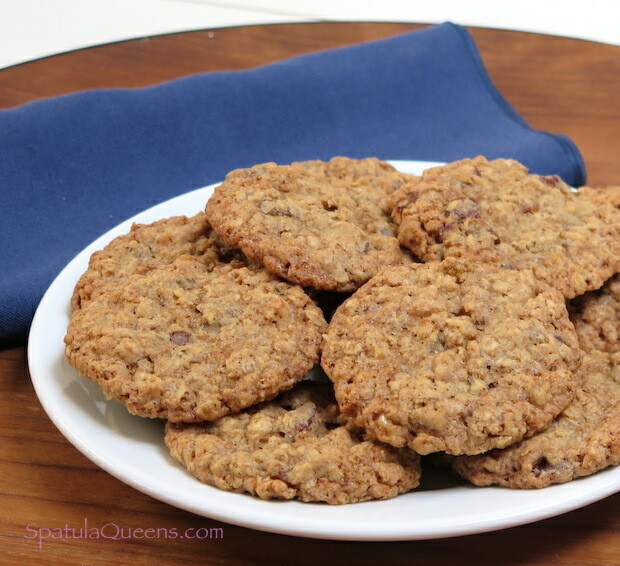 The combined changes make for the best crunchy chewy oatmeal cookie. We know, we’ve baked thousands of them! We changed the original recipe by omitting most of the spices. We like the crunch of walnuts over pecans. We also added cut up dates - not the pre-cut, sugared variety - the whole, gooey, moist kind. We also replaced the quick cooking oats with heartier old-fashioned oats. 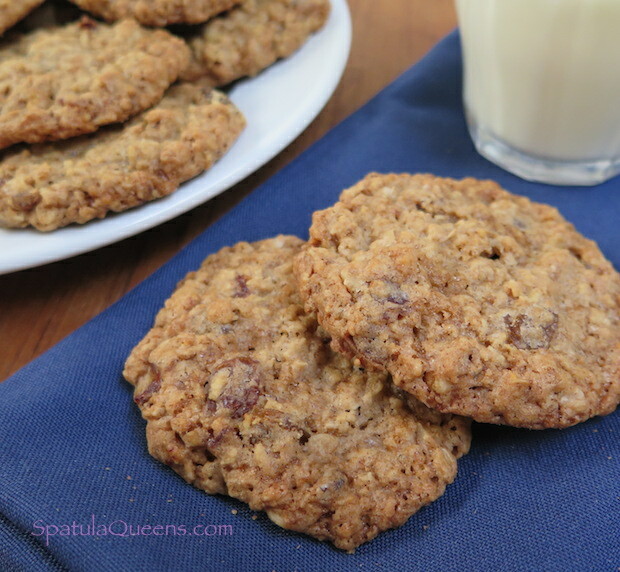 The combined changes make for the best crunchy chewy oatmeal cookie. In mixer fitted with paddle, beat butter and sugars until light and fluffy. Add flour mixture and beat until combined. Add oatmeal and mix until combined. Add walnuts, raisins and dates.